Official Google CPG Blog: Spring Cleaning Only? Help Needed, Year Round. Spring Cleaning Only? Help Needed, Year Round. Spring is finally here again. For many, the season ushers in Spring Cleaning, a time devoted to cleaning house from top to bottom. Which areas and rooms do people seem to have the most trouble with? 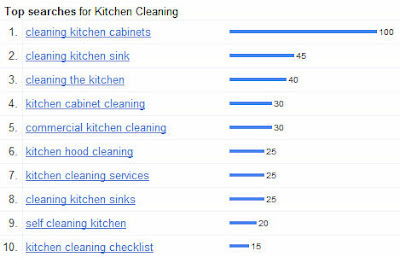 It looks like the kitchen is where consumers need the most help - specifically, when we look at the top searches related to kitchen cleaning, they are looking for tips around how to clean kitchen cabinets, the sink, and the stovetop range hood. So where do people go after they search the term “spring cleaning”? You may be surprised to discover that YouTube.com is the #5 destination for all “spring cleaning” broad-matched searches. [ii] In addition to searching for cleaning tips on Search engines, people are watching how-to videos for cleaning. There are 200,000+ video results for “how to clean home” and 700,000+ video results for “how to clean.” Clearly, people are turning online to research various topics and cleaning is no exception. Household cleaning brands can to reach consumers at the very moment consumers are looking for help. A Google search for "spring cleaning" only returns a few sponsored links for cleaning products, while the majority of sponsored links are cleaning services. Moreover, a search for "cleaning tips" on YouTube returns no brand presence in Promoted Videos. Marketers can keep their brands top of mind by maintaing a strong presence in both Google and YouTube search results. Though we all can't be Disney princesses with the magical cleaning help of animal friends, we can always turn to the magical help of Google and YouTube to help us solve cleaning dilemmas. [i] Google Insights for Search. Retrieved March 3, 2010 for 01.01.06-01.01.10. [ii] Compete Referral Analytics. Retrieved March 3, 2010 for 12.01.09-03.01.10.